At Flores, we believe in team empowerment and appreciation. Each month, our team nominates their peers for the “All-Star of the Month”. The winner of All-Star of the Month enjoys a month of “All-Star” priority employee parking, a gift card and lunch with managers! We are pleased to announce our April All-Star winner *drumroll please* — Judy Flores! Judy is always a team player. She has taken on a lot of responsibility and still always asks what else she can do to help. She follows templates and directions to a tee. Judy is an awesome team member of the company. She is always willing to help out without questions. Even if she doesn’t fully know how to do the task, she is self-motivated enough to learn and “figure” it out accurately. 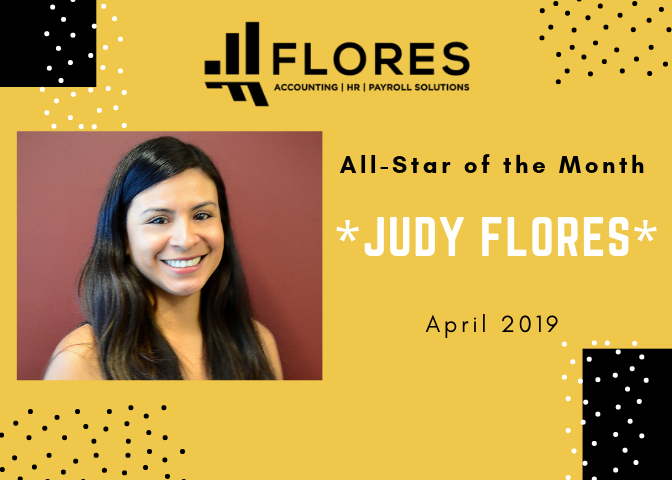 Judy is an integral part of our FLORES team. She is dependable, professional and overall a genuinely positive person. Her can do attitude and willingness to take on any challenge give to her is invaluable. She steps up every time and has become such an asset to our company. We are grateful to have her on our team as she truly represents what FLORES is all about which is amazing service backed by teamwork, accuracy, family, professionalism and integrity.